If quick hit-and-run updates like this are possible, why does Mordekaiser still have pizza feet? Only a week after Riot announced that Cho’Gath would receive brand new animations for his outdated abilities, those new visuals were uploaded onto the PBE. They’ve been available to try out on the test client for a week now, and although they look kickass, especially compared to their predecessors, it’s left us wanting more. If quick updates like this are possible for champions without having to give them full, large-scale redesigns, why are there still so many outdated abilities in the game? Mordekaiser deserves some answers. Don’t get us wrong, Cho’Gath’s new abilities are a huge improvement on what they were, but this ability update has called attention to the other aspects of the game that look like they were designed in 2009. Caitlyn still fires a weirdly shaped bird out of her rifle for her Q, and her basic attacks still look like pixelly rockets instead of bullets. When Udyr changes stances, the icon that floats above his head signaling his new stance still looks like something a child drew, and his basic attacks still look like he’s tickling someone. There are countless abilities and champions that still have parts that haven’t been updated since their creation so many years ago. Now, when compared to the sleek and shiny new champions and abilities of the game, they leave their fans feeling neglected. 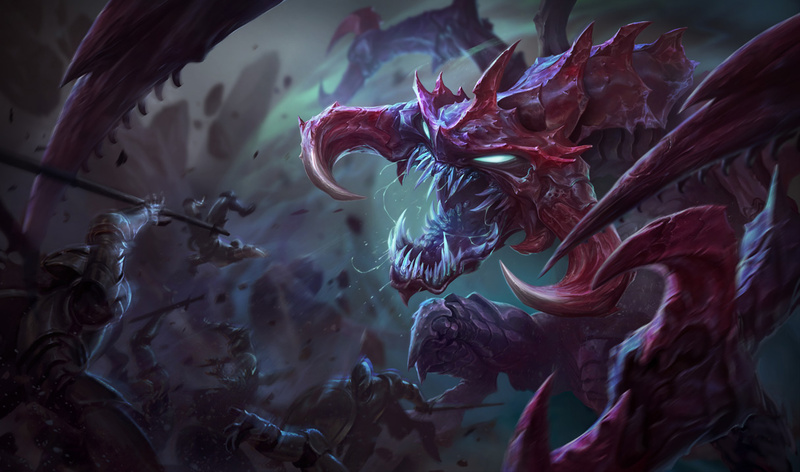 Now that Cho’Gath has been given the royal treatment, those players are going to get even more antsy as they wait for their favorite champion to be patched up as well. In Riot’s initial announcement of Cho’Gath’s new abilities, the company did mention that more partial updates would be coming in 2018, but that not all of them would be directed at visuals. Hopefully at least a significant portion of those updates turn out to be visual updates, though, because we can think of quite a few champions that desperately need it.